I’ve been cooking dinners from our new book EatingWell 500 Calorie Dinners five nights a week for a few weeks now as part of our 500-Calorie Dinner challenge. I’ve also talked with people about the book a lot, and one of the questions that keeps coming up is about cost. People wonder (or perhaps assume) that if you’re going to cook these great dinners every night it’s going to cost a lot of money. I’m not sure why people think it’s going to be expensive...because in fact many of the recipes in the book cost less than $3 a serving. Plus one of the keys to losing weight can also help you save money. What is it? Having a plan. Planning a delicious 500-calorie dinner (and then keeping the rest of your day to about 1,000 calories) will keep your daily total to about 1,500 calories, which is a level where most people can lose weight at a healthy rate. But the other benefit of planning out 500-calorie dinners to cook all week is that when you go to the grocery store you can be prepared with a good list. That way you buy just what you need and therefore have less waste. So, for anyone worried that it’s too expensive to cook delicious dinners, here are some fabulous recipes all under $3 per serving that show you just how cheap and easy it can be. 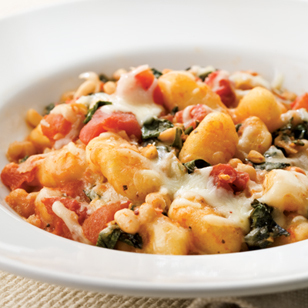 Skillet Gnocchi with Chard & White Beans – In this one-skillet supper, we toss dark leafy greens, diced tomatoes and white beans with gnocchi and top it all with gooey mozzarella. Serve with a mixed green salad with vinaigrette. Flemish Beef Stew – I made this recipe the other day. It’s a super easy slow cooker recipe and it has amazing flavor from beer and caraway seeds. Yum! Chicken Tetrazzini – This comfort food classic is a family favorite. Black-Eyed Peas with Pork & Greens – This delicious combo gets a little smoky flavor from smoked paprika. Beef & Bean Chile Verde – This recipe only takes about 20 minutes of active time. You can make it with lean ground beef, ground turkey or buffalo (my fave).